A 36-year-old man was reportedly found deceased in the toilets at the Strathallan Castle festival site in Perthshire. Colin Rodger, event manager for T in the Park, said he was “extremely saddened” by the discovery and that the festival organisers’ thoughts are with the family at this time. The death is currently being treated as “unexplained” and the festival is assisting police and emergency services with their inquiries. Officers are also believed to be investigating footage which has been published online apparently showing an assault taking place at the festival campsite. They have appealed to anyone with information to come forward “urgently”. So far Police Scotland have made 25 arrests during the festival which is due to end this evening with a performance from Noel Gallagher's High Flying Birds. 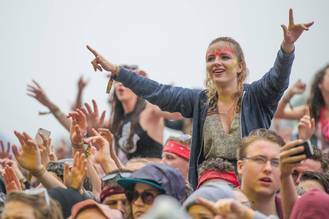 This weekend 85,000 descended on the festival site near Auchterarder attracted by a lineup which includedlast night's headline act Avicii, Jessie J, The Script and Twin Atlantic.